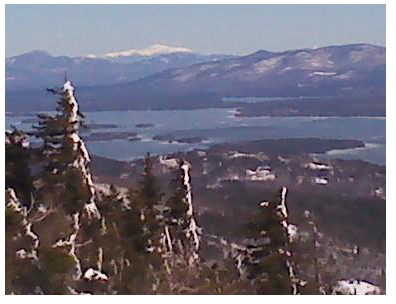 My favorite winter activity is skiing at Gunstock. In fact, we just went today. The snow was perfect and the weather was warm (sort of.) First thing in the morning, it was a bit chilly. We still needed winter coats. Around 10am or so, it was time to remove some layers. We actually got there early and we were ready for the first lift. The snow was hard packed, but not icy. As the day went on, the snow softened up and made it a bit slower to ski. But it was gorgeous blue skies and the view of Mount Washington was awesome. My favorite trails are Redhat and Recoil. I ski all the trails, but do several runs on those two. There's a new trail in the Pistol area with some open glades. The trees were far enough apart to not be that scary because there were moguls in there. At lunch time, we sat at picnic tables outside the little lodge to enjoy the warmth of the sun. The lift attendants are fun people too. They get into the spring skiing mood and it makes it fun for all the people riding up on the lift. Join in and write your own page! It's easy to do. How? Simply click here to return to Favorite Fun Winter Activities.